This article is about the Soviet space program starting from 1957. For the space program after the collapse of the Soviet Union, see Roscosmos State Corporation. The Soviet space program (Russian: Космическая программа СССР, Kosmicheskaya programma SSSR) comprised several of the rocket and space exploration programs conducted by the Soviet Union (USSR) from the 1930s until its collapse in 1991. Over its 60-year history, this primarily classified military program was responsible for a number of pioneering accomplishments in space flight, including the first intercontinental ballistic missile (R-7), first satellite (Sputnik 1), first animal in Earth orbit (the dog Laika on Sputnik 2), first human in space and Earth orbit (cosmonaut Yuri Gagarin on Vostok 1), first woman in space and Earth orbit (cosmonaut Valentina Tereshkova on Vostok 6), first spacewalk (cosmonaut Alexei Leonov on Voskhod 2), first Moon impact (Luna 2), first image of the far side of the Moon (Luna 3) and unmanned lunar soft landing (Luna 9), first space rover (Lunokhod 1), first sample of lunar soil automatically extracted and brought to Earth (Luna 16), and first space station (Salyut 1). Further notable records included the first interplanetary probes: Venera 1 and Mars 1 to fly by Venus and Mars, respectively, Venera 3 and Mars 2 to impact the respective planet surface, and Venera 7 and Mars 3 to make soft landings on these planets. The rocket and space program of the USSR, initially boosted by the assistance of captured scientists from the advanced German rocket program, was performed mainly by Soviet engineers and scientists after 1955, and was based on some unique Soviet and Imperial Russian theoretical developments, many derived by Konstantin Tsiolkovsky, sometimes known as the father of theoretical astronautics. Sergey Korolev (also transliterated as Korolyov) was the head of the principal design group; his official title was "chief designer" (a standard title for similar positions in the USSR). Unlike its American competitor in the "Space Race", which had NASA as a single coordinating agency, the USSR's program was split among several competing design bureaus led by Korolev, Mikhail Yangel, Valentin Glushko, and Vladimir Chelomei. Because of the program's classified status, and for propaganda value, announcements of the outcomes of missions were delayed until success was certain, and failures were sometimes kept secret. Ultimately, as a result of Mikhail Gorbachev's policy of glasnost in the 1980s, many facts about the space program were declassified. Notable setbacks included the deaths of Korolev, Vladimir Komarov (in the Soyuz 1 crash), and Yuri Gagarin (on a routine fighter jet mission) between 1966 and 1968, and development failure of the huge N-1 rocket intended to power a manned lunar landing, which exploded shortly after lift-off on four unmanned tests. With the collapse of the Soviet Union, Russia and Ukraine inherited the program. Russia created the Russian Aviation and Space Agency, now known as the Roscosmos State Corporation, while Ukraine created the National Space Agency of Ukraine (NSAU). The theory of space exploration had a solid basis in the Russian Empire before the First World War with the writings of Konstantin Tsiolkovsky (1857-1935), who published pioneering papers in the late 19th and early 20th centuries and in 1929 introduced the concept of the multistaged rocket. Practical aspects built on early experiments carried out by members of the reactive propulsion study group, GIRD (founded in 1931) in the 1920s and 1930s, where such pioneers as Sergey Korolev—who dreamed of traveling to Mars:5—and the German-Russian engineer Friedrich Zander worked. On August 18, 1933, GIRD launched the first Soviet liquid-fueled rocket Gird-09, and on November 25, 1933, the first hybrid-fueled rocket GIRD-X. In 1940-41 another advance in the reactive propulsion field took place: the development and serial production of the Katyusha multiple rocket launcher. Under the direction of Dimitri Ustinov, Korolev and others inspected the drawings. Helped by rocket scientist Helmut Gröttrup and other captured Germans until the early 1950s,:30,80–82 they built a replica of the V-2 called the R-1, although the weight of Soviet nuclear warheads required a more powerful booster. Korolev's OKB-1 design bureau was dedicated to the liquid-fueled cryogenic rockets he had been experimenting with in the late 1930s. Ultimately, this work resulted in the design of the R-7 Semyorka intercontinental ballistic missile (ICBM) which was successfully tested in August 1957. Because of its global range and large payload of approximately five tons, the reliable R-7 was not only effective as a strategic delivery system for nuclear warheads, but also as an excellent basis for a space vehicle. The United States' announcement in July 1955 of its plan to launch a satellite during the International Geophysical Year greatly benefited Korolev in persuading Soviet leader Nikita Khrushchev to support his plans in January 1956, in order to surpass the Americans. :148–151 Plans were approved for Earth-orbiting satellites (Sputnik) to gain knowledge of space, and four unmanned military reconnaissance satellites, Zenit. Further planned developments called for a manned Earth orbit flight by 1964 and an unmanned lunar mission at an earlier date. R-7 rockets like the one on display at the All-Soviet Exhibition Centre were the first reliable means to transport objects into Earth orbit. Unlike the American space program which had NASA as a single coordinating structure directed by its administrator, James Webb through most of the 1960s, the USSR's program was split between several competing design groups. Despite the remarkable successes of the Sputniks between 1957 and 1961 and Vostoks between 1961 and 1964, after 1958 Korolev's OKB-1 design bureau faced increasing competition from his rival chief designers, Mikhail Yangel, Valentin Glushko, and Vladimir Chelomei. Korolev planned to move forward with the Soyuz craft and N-1 heavy booster that would be the basis of a permanent manned space station and manned exploration of the Moon. However, Ustinov directed him to focus on near-Earth missions using the very reliable Voskhod spacecraft, a modified Vostok, as well as on interplanetary unmanned missions to nearby planets Venus and Mars. Yangel had been Korolev's assistant but with the support of the military he was given his own design bureau in 1954 to work primarily on the military space program. This had the stronger rocket engine design team including the use of hypergolic fuels but following the Nedelin catastrophe in 1960 Yangel was directed to concentrate on ICBM development. He also continued to develop his own heavy booster designs similar to Korolev's N-1 both for military applications and for cargo flights into space to build future space stations. Glushko was the chief rocket engine designer but he had a personal friction with Korolev and refused to develop the large single chamber cryogenic engines that Korolev needed to build heavy boosters. Chelomei benefited from the patronage of Khrushchev:418 and in 1960 was given the plum job of developing a rocket to send a manned craft around the moon and a manned military space station. With limited space experience, his development was slow. The Apollo program's progress alarmed the chief designers, who each advocated for his own program as response. Multiple, overlapping designs received approval, and new proposals threatened already approved projects. Due to Korolev's "singular persistence", in August 1964 —more than three years after the United States declared its intentions— the Soviet Union finally decided to compete for the moon. It set the goal of a lunar landing in 1967 —the 50th anniversary of the October Revolution— or 1968.:406–408,420 At one stage in the early 1960s the Soviet space program was actively developing 30 projects for launchers and spacecraft. 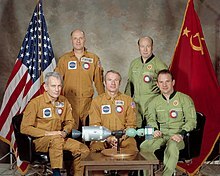 With the fall of Krushchev in 1964, Korolev was given complete control of the manned space program. Korolev died in January 1966 following a routine operation that uncovered colon cancer and from complications from heart disease and severe hemorrhaging. Kerim Kerimov, who was formerly an architect of Vostok 1, was appointed Chairman of the State Commission on Piloted Flights and headed it for the next 25 years (1966–1991). He supervised every stage of development and operation of both manned space complexes as well as unmanned interplanetary stations for the former Soviet Union. One of Kerimov's greatest achievements was the launch of Mir in 1986. Leadership of the OKB-1 design bureau was given to Vasily Mishin, who had the task of sending a man around the Moon in 1967 and landing a man on it in 1968. Mishin lacked Korolev's political authority and still faced competition from other chief designers. Under pressure Mishin approved the launch of the Soyuz 1 flight in 1967, even though the craft had never been successfully tested on an unmanned flight. The mission launched with known design problems and ended with the vehicle crashing to the ground, killing Vladimir Komarov. This was the first in-flight fatality. Following this disaster and under new pressures, Mishin developed a drinking problem. The Soviets were beaten in sending the first manned flight around the Moon in 1968 by Apollo 8, but Mishin pressed ahead with development of the problematic super heavy N1 in the hope that the Americans would have a setback, leaving enough time to make the N1 workable and land a man on the Moon first. There was a success with the joint flight of Soyuz 4 and Soyuz 5 in January 1969 that tested the rendezvous, docking and crew transfer techniques that would be used for the landing, and the LK Lander was tested successfully in earth orbit. But after four unmanned test launches of the N1 ended in failure, the heavy booster was abandoned and with it any chance of the Soviets landing men on the Moon in a single launch. Besides the manned landings, the abandoned Soviet Moon program included the multipurpose moonbase Zvezda, first detailed with developed mockups of expedition vehicles and surface modules. The later proposed manned moon program "Vulkan-LEK" was not adopted for economic reasons. Following this setback, Chelomei convinced Ustinov to approve a program in 1970 to advance his Almaz military space station as a means of beating the US's announced Skylab. Mishin remained in control of the project that became Salyut but the decision backed by Mishin to fly a three-man crew without pressure suits rather than a two-man crew with suits to Salyut 1 in 1971 proved fatal when the re-entry capsule depressurized killing the crew on their return to Earth. Mishin was removed from many projects, with Chelomei regaining control of Salyut. After working with NASA on the Apollo Soyuz Test Project, the Soviet leadership decided a new management approach was needed, and in 1974 the N1 was cancelled and Mishin dismissed. A single design bureau was created NPO Energia with Glushko as chief designer. In contrast with the struggles of its early manned lunar programs, the USSR found significant success with its remote moon operations, achieving two historical firsts with the automatic Lunokhod and the Luna sample return missions. Also, the Mars probe program was continued with some small success, while the explorations of Venus and then of the Halley comet by the Venera and Vega probe programs were more effective. 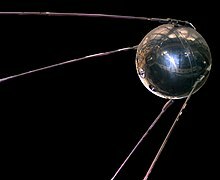 The Soviet space program had withheld information on its projects predating the success of Sputnik, the world's first artificial satellite. In fact, when the Sputnik project was first approved, one of the most immediate courses of action the Politburo took was to consider what to announce to the world regarding their event. The Telegraph Agency of the Soviet Union (TASS) established precedents for all official announcements on the Soviet space program. The information eventually released did not offer details on who built and launched the satellite or why it was launched. However, the public release is illuminating in what it does reveal : "there is an abundance of arcane scientific and technical data...as if to overwhelm the reader with mathematics in the absence of even a picture of the object". What remains of the release is the pride for Soviet cosmonautics and the vague hinting of future possibilities then available after Sputnik's success. The Soviet space program's use of secrecy served as both a tool to prevent the leaking of classified information between countries and also to create a mysterious barrier between the space program and the Soviet populace. The program's nature embodied ambiguous messages concerning its goals, successes, and values. The program itself was so secret that a regular Soviet citizen could never achieve a concrete image of it, but rather a superficial picture of its history, present activities, or future endeavors. Launchings were not announced until they took place. Cosmonaut names were not released until they flew. Mission details were sparse. We did not know the size or shape of their rockets or cabins or most of their spaceships, except for the first Sputniks, lunar probes and Venus probe. This image of the Soviet–Russian space station Mir was recorded by astronauts aboard the Space Shuttle Atlantis as it approached before docking during the STS-76 mission in 1996. However, because of its nature, the Soviet space program suffered a paradox. On one hand, officials attempted to promote the space program by frequently connecting its successes to the strength of socialism. On the other hand, the same officials understood the importance of secrecy in the context of the Cold War. This stress on secrecy in the USSR can be understood as a measure to protect its strengths and weaknesses. Such reasoning for secrecy was motivated by the desire to protect information necessary for national security. A desire that wished to positively promote the external image of the Soviet state to the outside world by limiting content which may taint its image, thus conveying the government's control over ideas and technology and the protection of Soviet inventions. However, the military influence of the Soviet space program may be its most sweeping explanation for the shroud of secrecy that surrounded the program. The early successes of the program (Sputnik, Laika, Yuri Gagarin) orchestrated by the Experimental Design Bureau-1 (OKB-1) were undoubtedly a critical factor. The OKB-1 was subordinated under the Ministry of General Machine Building. This ministry had been a highly secretive military-industrial complex that had been targeted by Western intelligence forces' scrutiny during the Cold War. Originally, the OKB-1's primary goal was the production and further improvement of intercontinental ballistic missiles. This changed in the 1960s with the shift in gears towards the "space race", but the association with the overtly military missile project remained and the Soviet space program's achievements were covered in another layer of secrecy. Military affairs regarding the development of weapons, like the intercontinental ballistic missile project operated under the most clandestine practices. Soviet military industrial officers constructed an esoteric policy of labeling weapons which relied on a logic-less random number-letter system. "For example the Vostok spacecraft was referred to as 'object IIF63' while its launch rocket was 'object 8K72K'". Even the factory workers contracted to build and deliver parts for spacecraft construction had a minuscule conception of the larger picture. Enforced rules and separate divisions of access prevented workers of one section to gain knowledge of what was going occurring in other developmental departments. The origin of intense military secrecy, which eventually branched into the space program, emerged as a temporary practice first adopted during the Civil War. These clandestine measures were reapplied in 1927 with the renaming of defense factories to sets of numbers. This practice would be adopted into research and design projects within the factories, and the tradition would continue in order to obfuscate Soviet goals from their adversaries. However, still paranoid that Western intelligence forces would be able understand the private code, employees were not allowed to discuss the code in public but rather needed to refer to the factories, institutes, and departments in public by using another code, a special post office box numbers, for their identification. In retrospect, one can now observe the pattern which emerged as Soviet Space exploits became more frequent. The program eliminated contingency in its announcements to the public. As far as the people knew, the Soviet space program had never experienced failure. According to author/historian James Andrews, "With almost no exceptions, coverage of Soviet space exploits, especially in the case of human space missions, omitted reports of failure or trouble". Out of fear of admitting any defeat, reports of cosmonauts' missions leaned towards an exaggerated positive spin rather than factual substance. "The USSR was famously described by Winston Churchill as 'a riddle, wrapped in a mystery, inside an enigma' and nothing signified this more than the search for the truth behind its space program during the Cold War. Although the Space Race was literally played out above our heads, it was often obscured by a figurative 'space curtain' that took much effort to see through" says Dominic Phelan in the book Cold War Space Sleuths (Springer-Praxis 2013). However, the demands for the secrecy, which revolved around the space program, likely were influenced by overarching Soviet military imperatives. 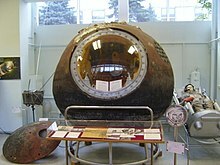 Vostok 1 capsule which carried Yuri Gagarin on the first manned space flight, now on display at the RKK Energiya museum outside of Moscow. Two days after the United States announced its intention to launch an artificial satellite, on July 31, 1956, the Soviet Union announced its intention to do the same. Sputnik 1 was launched on October 4, 1957, beating the United States and stunning people all over the world. 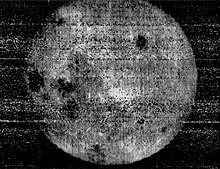 1959: First data communications, or telemetry, to and from outer space, Luna 1. 1960: First animals to safely return from Earth orbit, the dogs Belka and Strelka on Sputnik 5. 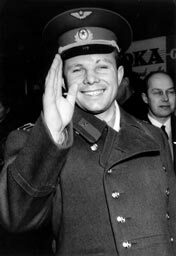 1961: First person to spend over 24 hours in space Gherman Titov, Vostok 2 (also first person to sleep in space). 1967: First unmanned rendezvous and docking, Cosmos 186/Cosmos 188. 1970: First robotic space rover, Lunokhod 1 on the Moon. Mir's Legacy - The core modules of the International Space Station, Phase Two of the ISS program. The Soviet space program Buran produced the Space Shuttle Buran based on the 3rd in history super heavy Energia launcher. Energia would be used as the base for a manned Mars mission. Buran was intended to operate in support of large space based military platforms as a response first to the US Space Shuttle and then the Strategic Defense Initiative. By the time the system was operational, in 1988, strategic arms reduction treaties made Buran redundant. On November 15, 1988, the Buran orbiter and its Energia rocket were launched from Baikonur Cosmodrome in Kazakhstan, and after three hours and two orbits, glided to a landing a few miles from its launch pad. Several vehicles were built, but only the one flew an unmanned test flight into space; it was found too expensive to operate as a civilian launcher. Marsokhod heavy rover Mars 4NM was going to be launched by the abandoned N1 launcher sometime between 1974 and 1975. Mars sample return mission Mars 5NM was going to be launched by a single N1 launcher in 1975. Mars sample return mission Mars 5M (ru) was to be double launched in parts by Proton launchers, and then joined together in orbit for flight to Mars in 1979. The Vesta mission would have consisted of two identical double-purposed interplanetary probes to be launched in 1991. It was intended to fly-by Mars (instead of an early plan to Venus) and then study four asteroids belonging to different classes. At 4 Vesta a penetrator would be released. The Tsiolkovsky mission was planned as a double-purposed deep interplanetary probe to be launched in the 1990s to make a "sling shot" flyby of Jupiter and then pass within five or seven radii of the Sun. A derivative of this spacecraft would possibly be launched toward Saturn and beyond. The Soviet space program has experienced a number of fatal incidents and failures. The Nedelin catastrophe in 1960 was a disastrous explosion of a fueled rocket being tested on launchpad, killing many technical personnel, aerospace engineers, and technicians working on the project at the time of the explosion. The first official cosmonaut fatality during training occurred on March 23, 1961, when Valentin Bondarenko died in a fire within a low pressure, high oxygen atmosphere. The Voskhod program was canceled after two manned flights owing to the change of Soviet leadership and nearly fatal 'close calls' during the second mission. Had the planned further flights gone ahead they could have given the Soviet space program further 'firsts' including a long duration flight of 20 days, a spacewalk by a woman and an untethered spacewalk. The Soviets continued striving for the first lunar mission with the huge N-1 rocket, which exploded on each of four unmanned tests shortly after launch. The Americans won the race to land men on the Moon with Apollo 11 on July 20, 1969. In 1971, the Soyuz 11 mission resulted in the deaths of three cosmonauts when the crew capsule depressurized during preparations for re-entry. This accident resulted in the only human deaths to occur in space (as opposed to high atmosphere). The crew members aboard Soyuz 11 were Vladislav Volkov, Georgi Dobrovolski, and Viktor Patsayev. On April 5, 1975, Soyuz 7K-T No.39, the second stage of a Soyuz rocket carrying 2 cosmonauts to the Salyut 4 space station malfunctioned, resulting in the first manned launch abort. The cosmonauts were carried several thousand miles downrange and became worried that they would land in China, which the Soviet Union was then having difficult relations with. The capsule hit a mountain, sliding down a slope and almost slid off a cliff; however, the parachute lines snagged on trees and kept this from happening. As it was, the two suffered severe injuries and the commander, Lazerev, never flew again. On March 18, 1980, a Vostok rocket exploded on its launch pad during a fueling operation, killing 48 people. In September 1983, a Soyuz rocket being launched to carry cosmonauts to the Salyut 7 space station exploded on the pad, causing the Soyuz capsule's abort system to engage, saving the two cosmonauts on board. In addition to these, there have been several unconfirmed accounts of Lost Cosmonauts whose deaths were allegedly covered up by the Soviet Union. See also the complete list of space disasters. DRAKON, an algorithmic visual programming language developed for the Buran space project. ^ "Gorodomlya Island". Russianspaceweb.com. Archived from the original on 2016-03-03. Retrieved 2016-01-19. ^ "German rocket scientists in Moscow". Russianspaceweb.com. Archived from the original on 2016-01-04. Retrieved 2016-01-19. ^ The early US space program was developed predominantly by scientists and rocket engineers from Nazi Germany who immigrated to the United States after World War II and was based on German technological experience, and the early Soviet program also benefited from Nazi German experience (see Helmut Gröttrup). ^ a b c d e f g h i j k l m n Siddiqi, Asif A. Challenge To Apollo: The Soviet Union and the Space Race, 1945-1974. NASA. Archived from the original on 2006-10-08. ^ John Pike. "Katyusha Rocket". Globalsecurity.org. Retrieved 2016-01-19. ^ "Rockets & People" (PDF). History.nasa.gov. Retrieved 2016-01-19. ^ Wade, Mark (1997–2008). "Soyuz". Encyclopedia Astronautica. Archived from the original on January 17, 2010. Retrieved July 15, 2009. ^ "Йепхл Юкхебхв Йепхлнб". Space.hobby.ru (in Russian). Retrieved 2016-01-19. ^ "LEK Lunar Expeditionary Complex". Astronautix.com. Archived from the original on 2013-12-08. Retrieved 2016-01-19. ^ "DLB Module". Astronautix.com. Archived from the original on 2014-01-07. Retrieved 2016-01-19. ^ a b c d "Into the Cosmos: Space Exploration and Soviet Culture". Books.google.com. Retrieved 2016-01-19. ^ a b "OhioLINK Institution Selection". Ebooks.ohiolink.edu. Retrieved 2016-01-19. ^ Launius, Roger (2002). To Reach the High Frontier. University Press of Kentucky. pp. 7–10. ISBN 0-8131-2245-7. ^ Rincon, Paul; Lachmann, Michael (October 13, 2014). "The First Spacewalk How the first human to take steps in outer space nearly didn't return to Earth". BBC News. BBC News. Archived from the original on 2014-10-14. Retrieved 2014-10-19. ^ "Buran - the Soviet 'space shuttle'". BBC. November 20, 2008. Retrieved 2010-01-01. ^ "Марс-79 — Википедия". Russian Wikipedia (in Russian). Retrieved 2016-01-19. ^ Zak, Anatoly (February 5, 2013). "Planetary spacecraft". Russian Space Web. Retrieved May 13, 2016. ^ James E Oberg (May 12, 1981). Red Star in Orbit. ISBN 978-0394514291. ^ "MEDIA REPORTS | Soviet rocket blast left 48 dead". BBC News. Retrieved 2016-01-19.